A potential trade agreement between the U.S. and China could face challenges from other World Trade Organization members depending on the details of the pact and whether other nations feel it unfairly hurts them, the group’s chief said. 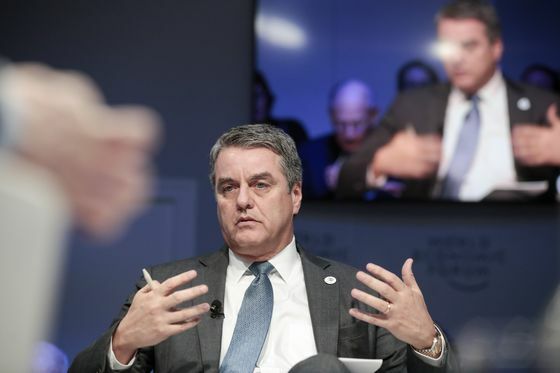 The U.S. and China appear to have the political will to reach a deal to relieve perhaps the biggest tension in global trade, although things could still fall apart, WTO Director-General Roberto Azevedo said in an interview in Mexico City on Thursday. The WTO’s purpose is to allow countries to check the actions taken by others if they think that they violate the organization’s rules, he said. China and the U.S. claimed progress in talks to end their trade war this week, with President Xi Jinping pushing for a rapid conclusion and President Donald Trump talking up prospects for a “monumental” agreement. Trump said any deal is probably still weeks away. Drafts of an agreement to end a nearly yearlong trade war would give Beijing until 2025 to meet commitments on commodity purchases and allow American companies to wholly own enterprises in the Asian nation, according to people familiar with the talks. Those would be binding pledges that could trigger U.S. retaliation if unfulfilled, according to the people, who asked not to be identified because the talks are private. The WTO earlier this week slashed its global trade growth projection for 2019 to the lowest level in three years, citing the impact of rising commercial tensions and tariffs. 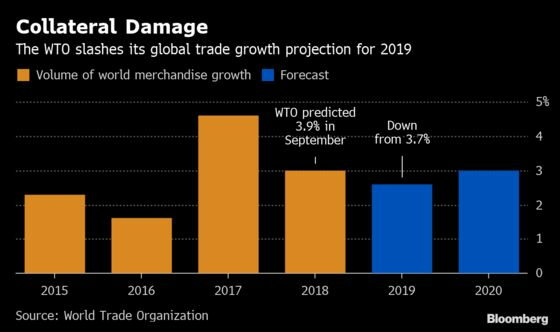 World merchandise trade growth will slow to 2.6 percent this year and 3 percent next year, after notching 3 percent in 2018, according to the WTO. In September, the group said trade would increase by 3.9 percent in 2018 and 3.7 percent in 2019. The WTO is set to rule for the first time on a dispute involving a member’s national security, with potential implications for Trump’s metal tariffs. Azevedo said he has been encouraging members to settle such conflicts politically with one another rather than seeking a technical decision through the group’s settlement mechanisms, which he called "a very dangerous development." The WTO allows countries to take “any action which it considers necessary for the protection of its essential security interests,” and has become a favorite justification for Trump, who last year imposed tariffs on steel and aluminum imports and has threatened levies on car imports. The dispute before the WTO involves trade sanctions Russia imposed on Ukraine, according to an official with knowledge of the report who asked not to be named because the process is private. A WTO ruling on the case could force the U.S. to justify why the European Union, Canada, Mexico and a half-dozen other nations that have filed disputes against Trump’s metal tariffs pose a security threat, and put the arbiter of international trade conflicts on a collision course with America.